This Candy Cane Hide & Seek Game is a quick, easy, and inexpensive Christmas activity for kids. It can be done at home, in the classroom, or at a Christmas party. It also works great as an elf activity if you do Elf on the Shelf in your home or classroom. A couple of years ago we were looking for some new and fun activities for our elf. A quick search turned up a picture someone had shared of their elf holding a handwritten note telling the kids he had hidden candy canes. Our kids love, love, love playing games and this one did not disappoint. It was a definitely a win and now an annual tradition. I love it too. Not only is it super easy to set up, but it’s also really inexpensive. All you need is this free printable and candy canes, which you can pick up at the dollar store. This Candy Cane Hide & Seek Game started with our elf, but we have set it up a few times ourselves with the kids. Handwritten notes work, but this free printable makes it a little more festive and disguises your handwriting if you elf is setting up the activity. To get started print this Hide and Seek Candy Cane game printable on 8 1/2×11 paper. I like to print them on card stock paper. You could even laminate it and use a dry erase marker to make it resueable. 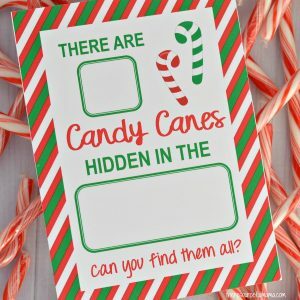 Fill in the two boxes on the printbable with the number of candy canes you are hiding and the room where you are hiding the candy canes. Give the printable to the players or leave it out for them to see. When we do this with our elf, we sit the elf in the room and lay this in his lap.